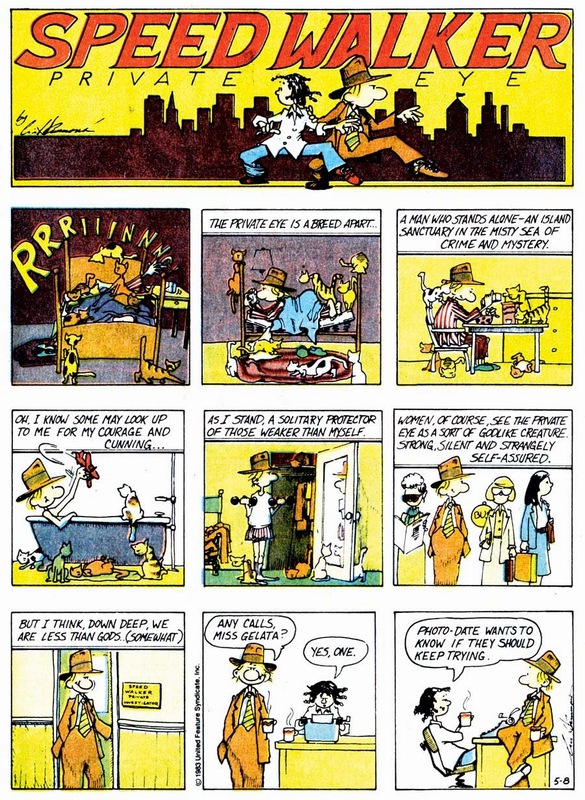 In the heyday of the continuity strip, most every feature told an ongoing story -- didn't much matter whether the strip was in the humor or drama category. By the 1980s, though, the concept of a humorous continuity strip had practically become extinct. For Better or For Worse was starting to dabble anew in the form, but it was an exception. Into that vacuum Cris Hammond brought Speed Walker Private Eye, a humor strip that, at least in the dailies, told wacky detective stories that ran as long as three months. 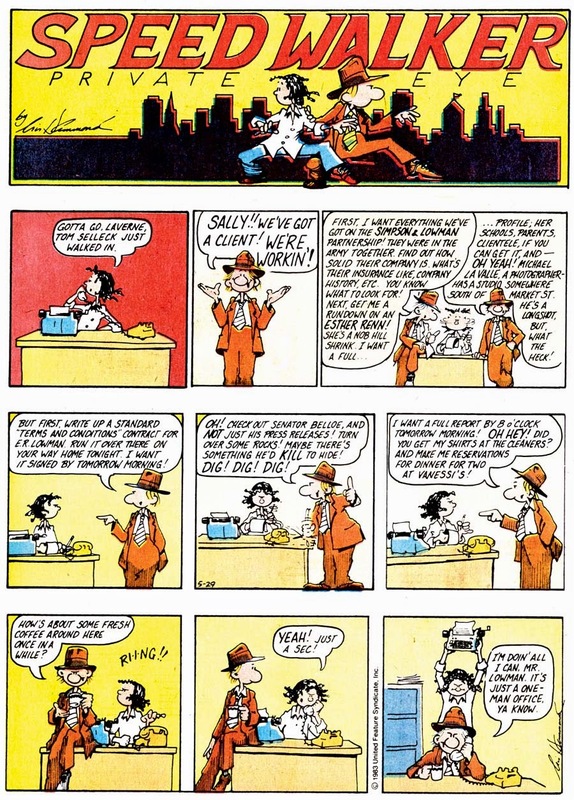 The strip debuted on May 2 1983, syndicated by United Feature Syndicate. I'm impressed that United was willing to give the strip a chance, and if we believe the marketing, it seems to have paid off. Supposedly the strip got signed by 150 newspapers, which is a very fine start. 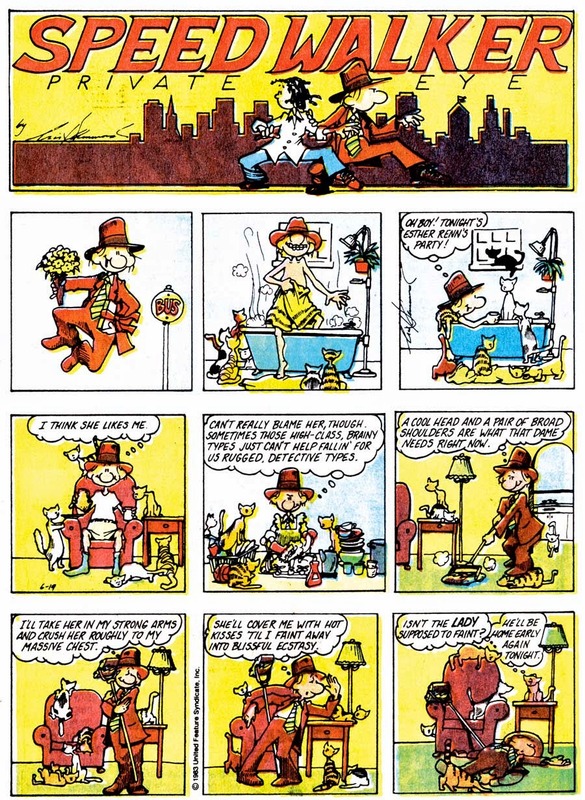 Though I confess I haven't read much of the daily continuity of Speed Walker, I get asked about this strip often enough by fans even today that Hammond's feature was definitely finding an appreciative audience. In fact, before the strip was a year old, two book collections were already published by Pinnacle -- Speed Walker Private Eye and Totally Fearless. Both are now available, though often rather pricey, on the collectible book market. Cris Hammond said about the work load that "I'll probably be stark staring mad in a few years." Turns out Hammond had nothing to worry about. 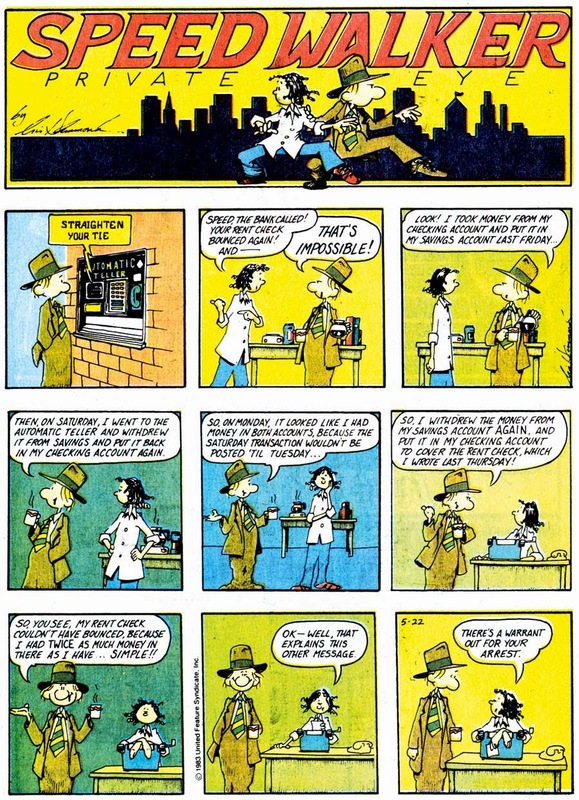 When the strip was just a bit past its first anniversary, on August 27 1984, it was cancelled. Although I don't know the facts involved in the cancellation firsthand, one person online commented that "he [Hammond] was getting bored and finding it hard to write gag a day mysteries. He stopped the strip to take a job with Lucas Films Industrial Lights & Magic to design special effects where he made lots of money doing something he enjoyed." Hammond has a few websites of interest -- his cartooning and graphics site, and one for his webcomic Rainbow's End and a book about barge boating in France.